Bob's Best Chlorella is a natural SUPERFOOD packed with vitamins and minerals that help you detoxify, nourish and revitalize your body naturally and enhance your overall health. Developed by Robert Barefoot and cultivated in clean, uncontaminated, and environmentally protected pure mountain spring water in Taiwan (Formosa Island). Our chlorella is the purest, most absorbable chlorella on the market and has an extremely high digestibility rate because of the patented low pressure flash expansion cracked cell process. 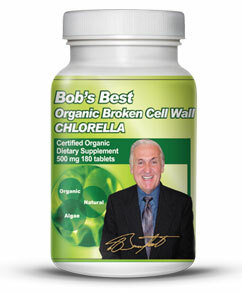 Bob’s Best Chlorella was designed to help the body boost its natural defense system to better fight off disease-causing germs and microorganisms. It also aids in the stimulation of the body’s health-protecting T-cells. Because of its effective purification properties, Bob’s Best Chlorella™ is also helpful in fighting off the harmful effects of aging. It is a rich source of nucleic acids—also known as the body’s building blocks—which help stimulate and revitalize the body as it ages, through cell restoration. This translates to a natural youthful glow. Finally, Bob’s Best Chlorella™ is a good source of “super energy” because the chlorella in this supplement acts as a catalyst that helps the body’s cells absorbs more oxygen. Low oxygen levels have been linked to increased incidences of fatigue and a feeling of overall weakness.